In October 2010 Arkade Graphics went into Gatehouse School in Milton Keynes. Tom , a student at the school , was looking into japanese style art work as part of his art project. He wanted to re-create a painting that he had seen in a book and paint it on the front of a metal container which is on the school premises (with permission from the school). Arkade Graphics mentored him with the tools and techniques he needed to produce the piece. I think the painting came out superbly considering the weather was against us. Tom worked well with little instruction and we wish him well and all the best with this and any future projects. 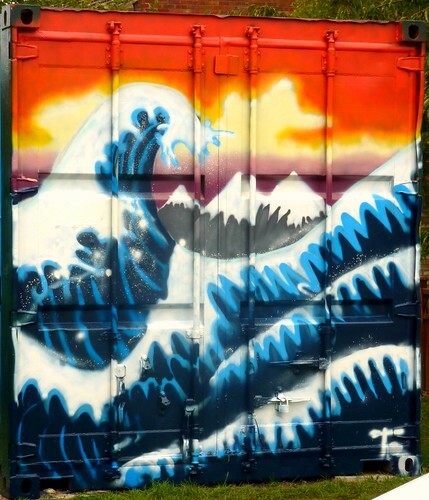 This entry was posted in Workshops and tagged art by students, container painting, gatehouse school milton keynes, Japanese style art. Bookmark the permalink.